While I’m tiptoeing down memory lane I might as well post the sequel. 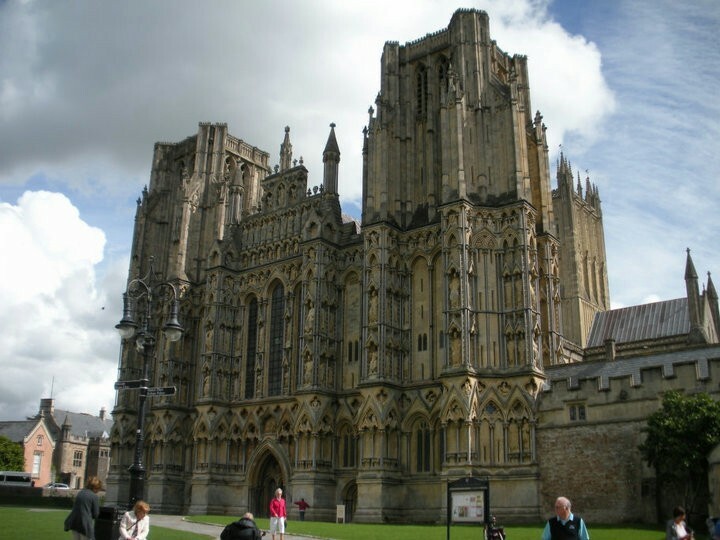 Wells Cathedral is breathtaking. More wonderful piccies. 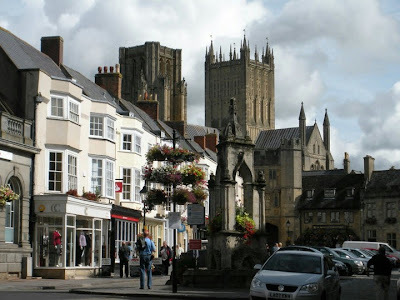 Interesting one there, ‘village of Wells’ when technically it is a cathedral city. Don’t we have some whacky definitions in the UK? 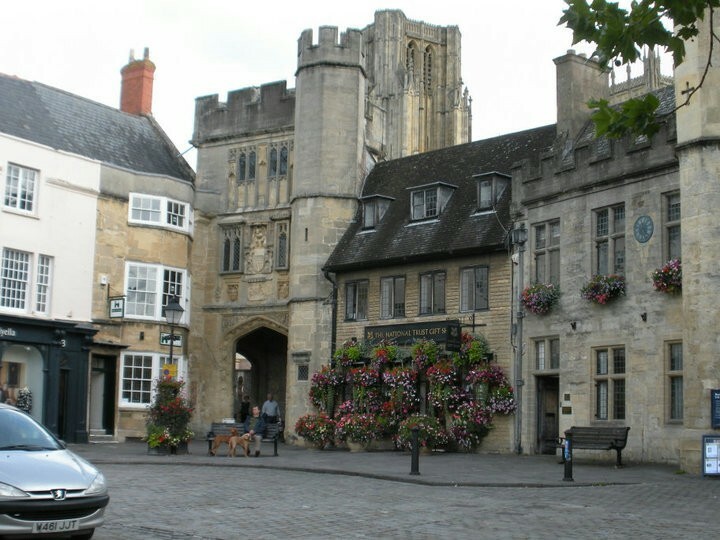 And should an urban population be defined by its major place of worship? 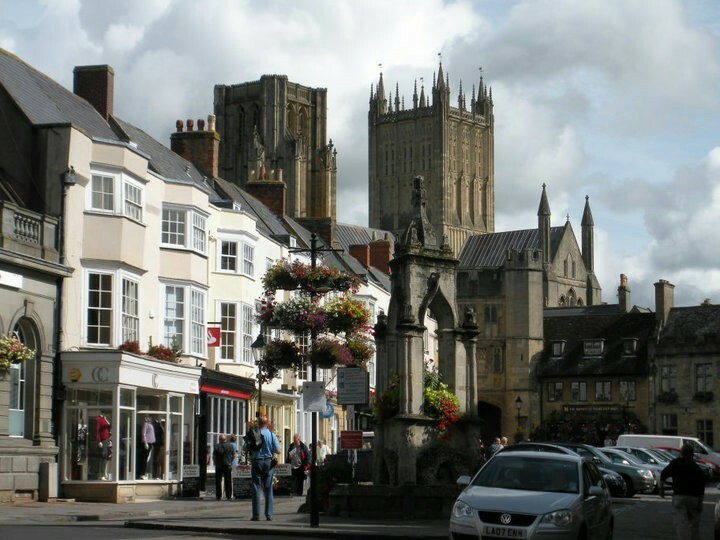 Interesting one there, ‘village of Wells’ when technically it is a cathedral city. That gave me imagery of yellow brick roads and munchkins. 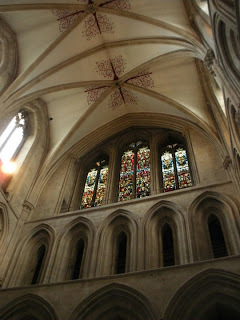 Thank you for the beautiful images of church art and architecture you reposted. I am glad that at some level something Christian seems to resonate with you. There are far better ideas of Christ than you have ever known and that you are now unwilling to consider. It’s too bad you got hurt and now have a claque that supports you in your rejection of Christianity. Still, who knows, except your imaginary friend, how it will end. I continue to have hope for you. I do have some questions, though: How do you know there are far better ideas of Christ than I have known and am unwilling to consider? How do you know what I am an am not willing to consider? How do you know what I have and haven’t already considered? Do you really think that the reason I am now not a Christian is because I got hurt? Why do you think that? Let me now answer your questions as best I can. As to there being better ideas of Christianity than you have been exposed to, I am going to have to refer you to my post “The Reformation of American Christianity” at http://waltsamp.wordpress.com where I describe the defects of all the versions of American Christianity that I am aware of. If you have known or participated in one not described please let me know because I am open to a better one than I now experience. By the way, the churches are not listed by denomination but by their character. As to what you are willing to consider, you are right about my ignorance. I do know though that I haven’t found any ideas you would consider. What I think I have found is a person who has expended a great amount of time and effort, and whole lots of words, to create for themselves an impregnable worldview. However, a short, and I thought not unkind, comment triggered a very defensive reaction. My supposition that you left Christianity because of some painful experience is apparently wrong. From some of what you have written perhaps it was dissatisfaction with God neglecting you or displeasing you or not measuring up to your standard (although this last one is pretty silly). Perhaps it was that you found Christianity had defects. People have been finding reason not to believe in Christ for 2,000 years so it’s unlikely you found a new one. You thought it odd that Tessa would come to you in her need. I did too. However, now I am wondering if she saw in you a person that was meant to be somebody who comforted hurting people. Perhaps that is what God intended you to be when he was thinking of you way back before the creation of the universe. If that is the case you might as well give up the fight and agree to God’s purpose for your life, namely to make you his eternal child so that eventually you would live in glory forever. I think you will make that choice and when you do you will find what you have been seeking. How many of my posts have you read? I’m pretty certain that I expressed that I didn’t find your intention to be unkind. But, again, you presume to know my reasons for rejecting Christianity and instead of outright asking me, you make more presumptions because it’s apparent that you believe a person only rejects Christianity for emotional reasons; displeasure, pain, etc. You even seem to have figured out God’s purpose for me. Do you not think it possible that a person could reject Christianity on the basis that it isn’t true? Or at least they aren’t persuaded to believe it is true? For the record, I don’t think your intent is to be unkind. I just think you are oblivious to the ways in which you are being rude. I did not think it odd that Tessa would come to me in her need. I just realized she would not be comforted by what I believe to be true. Are you suggesting that I should change that to suit others? If you think that it is God’s purpose for me to comfort hurting people then I am exactly where I should be. Many people have been hurt by these beliefs. I will comfort them when I can. What I think I have found is a person who has expended a great amount of time and effort, and whole lots of words, to create for themselves an impregnable worldview. An impregnable worldview? And are you willing to change your view that Jesus is the Christ? Yes, that. IOW, what he seems to be implying is that you are the one with the religious conviction, when if fact, a) you no longer belong to any religion(that I know of), and b) you’ve actually changed your mind once(and I’m guessing you’d do it again if you were presented with credible evidence that there exists an invisible, conscious creator being). In plain terms, he’s insinuating that you don’t want to believe that Christianity is true. He’s second-guessing your judgement and pretending to know your mind better than you. This seems to be a common theme when it comes to Christians exuding “kindness” and “concern”. I have changed my mind about a number of things. Even recently. I know that might be a shock, but still. I’m planning a post about this particular exchange. I’m not offended that waltsamp is proselytizing. That’s what Christians do. I wouldn’t even be offended if he wanted to present what he thinks is the evidence for Christianity. I’m just a little offended that he seems to think that he knows me better than I know myself, he’s read a handful of posts and thinks he’s boiled down my possible reasons for my current disbelief, and what kind of belief I had before. It must have been bad. Injurious. The kind that leads to disillusionment and disappointment. He seems to think that deep down I really do think there’s a God and that I’m just “going through a phase” because I’m dejected. From some of what you have written perhaps it was dissatisfaction with God neglecting you or displeasing you or not measuring up to your standard (although this last one is pretty silly). Assuming that there exists a god for sake of discussion, why is it so “silly” or far-fetched to harbor expectations of this god, which, BTW, we are to believe the Christian version is things like infinitely intelligent, omniscient, and omnipotent, to not only measure up to our standard, but to vastly exceed it??? Seriously. If I know what compassion and empathy are, then surely a god’s idea of compassion and empathy aren’t worse than mine, but far, far better. But for some strange reason, theists, namely Christians, scoff at the idea that anyone would have the nerve to question the standard and/or motives of the god described in their bibles. Yet, it’s interesting that, if a theist’s own standard means nothing in comparison to the god they happen to worship, then how on earth would they even know that they’re worshiping a benevolent god as opposed to malevolent one?? You would need to be able to trust your own standard to even be able to make such a judgement, but yet, we’re being told our own standard is essentially garbage in comparison to the standard of “God”. Having read the Bible through, I would say that if the God of the Bible exists, that God is both benevolent and malevolent. While most Christians want to project that God is omni-benevolnent, this is not the God that is depicted in scripture. In comes Divine Command Theory. That whatever God has done, even though it may seem bad, since his character can only be good, then the act was good. Take the Israelites(probably fictitious) war on the Canaanites: in our minds declaring war on another nation for the sole purpose of taking their land much less slaughtering every man, woman, child, and animal would be grossly malevolent. It would be a disgusting act of genocide; an atrocity. However, if commanded by a purportedly omni-benevolent God then there must be a good reason for it even if we don’t know what that is. There are far better ideas of Christ than you have ever known and that you are now unwilling to consider. ‘Anyone see what’s taking place here? The implication seems pretty clear to me: If one doesn’t find the evidence/arguments for Christianity to be credible, then, oh, they just aren’t willing to consider the best of that evidence or those arguments. This mindset is nothing new, of course. “Still, who knows, except your imaginary friend, how it will end. Whether “God” is imaginary or real makes not one iota of difference where omniscience is concerned. A prescience of “how it will end” means our “free will” is an illusion, at best. Well, of course boomslang. waltsamp seems genuinely concerned and, I think, attempting to be kind. I don’t think he/she realizes that this comment was wrapped in condescension. As if my deconversion, itself, wasn’t painful. I feel like he/she isn’t aware of the difficulty of deconversion. If one surrounds themselves with Christian friends and like-minded individuals that is to be celebrated. If one finds like-minded individuals with whom disbelief is the shared quality that is “a clique”. I’m sure waltsamp means well. There’s just an awful lot of presumption in their already-drawn conclusions. The picture in Wikipedia of a boomslang is of a green, poisonous snake. It seems appropriate for your pseudonym. You are acting as a servant of that Ancient Serpent, Satan. The goal of the Evil One is the physical and spiritual destruction of as many humans as can be deceived. What you tell Ruth is clever lies. However when the scales figuratively fall from her eyes, as I hope they will, she will see you as the loathsome being you are. As for your cleverness, you suffer from the fatal defect of atheistic logic. That is, you are unable to think that anything can exist unless you know of it, understand it, experience it or approve of it. By the way, written in a condescending tone, the word I used was claque not clique. A claque can be a group of sycophants. This seems to be an appropriate term for Ruth’s supporters who encourage her in your deceptions. Is this your better idea of Jesus? That you would call people who disagree with you servants of Satan, loathsome, and sycophantic? Let me assure you that no one here gains any advantage by either agreeing with me nor “buttering me up”. So that description is not apt in any way. The fact that the disbelief of others causes you disgust is really your problem, not theirs. And calling people servants of a being they don’t even believe exists is really rather childish. I did go over and read the post you recommended. You seem to still be under the impression that my disbelief is the result of some displeasure or injury by the church or organized religion. This simply is not the case. What I found there had no relevance to my situation at all. As an atheist there are many things that exist that I do not approve of. There are also a great many things that I do not understand. But they are actual, physical, things. We are not the ones who believe in invisible deities, beguiling serpents, demons, and angels. And yet we are the ones who are deceived? Correct, Nan. I’m as worried about “Satan” and his private, gated community, “Hell”, as I am about being cursed by “Allah” and sent to “Jahannam”. I am as worried about encountering waltsamp, as I am worried about encountering a black cat in my backyard. And that, of course, is not worried in the least bit. See, what waltsamp fails to realize when he tries to denigrate “Atheist logic”, is that, ironically, it’s the same, exact logic that he uses to conclude that “Allah” is completely imaginary, as is “Jahannam”(the Islamic equivalent of “Hell”). Using “atheist logic”, we atheists know that Muslims are deluded and have been self-deceived, despite that they will swear up ‘n down that they’re “right”(you know, like Christians). But this isn’t “our” logic, because there is no “his logic”, “her logic”, “their logic”, etc., there is only logic. Waltsamp uses this same logic. Unfortunately, theist’s use logic selectively, aka, compartmentalization. This allows theists such as waltsamp to harbor, untouched, the beliefs that they wish were true, while they apply the same logic that the rest of us use to every other superstitious belief but their own. Okay, fine. I mean, we’ve heard it a gazillion times, right? Yes, so let’s go ahead and grant the assertion for sake of discussion. Done. So, riddle me this(waltsamp, or any lurking Xian)—if this “Evil One” is the biggest threat and detriment to “God’s plan”, then please-oh-please, feel free to provide a coherent, compelling argument for why this “God” didn’t nip it in the bud at the onset of the problem. Yes, because if one or more of the angels of “God” rebelled, yadda, yadda, then surely “God”, whom we are to believe is “omnipotent” and can create universes at will, could have smote this “Evil One” on the spot, but for some mysterious reason, did not. So, riddle me this(waltsamp, or any lurking Xian)—if this “Evil One” is the biggest threat and detriment to “God’s plan”, then please-oh-please, feel free to provide a coherent, compelling argument for why this “God” didn’t nip it in the bud at the onset of the problem. If anyone knew the answer to this it would ruin the mystique. You know that God works in mysterious ways, don’t you sneaky snake? Perhaps. Unfortunately, a lot of times when we see Christians being concerned and attempting kindness towards non-Christians, we, being on the outside of the Christian bubble, know that at least a fraction of that concern and kindness is ill-founded and ends up being just the opposite of its intent, specifically, when Christians are concerned about our “eternal souls” and when they feel that second-guessing our experiences is somehow an act of “kindness”. Like, “tough love”, or something. Me, too. 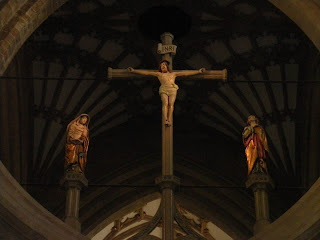 But once more, meaning well in terms of Christianity can include things that would otherwise be completely rude if attempted without a religious conviction behind it. Imagine a guy barging into a support group for battered wives saying things like, “There’s no such thing as an ex-wife!”, or “You were never really married!”, or “You didn’t give it a fair chance!”, and the like. Something tells me that that wouldn’t sit too well. Precisely. I don’t think waltsamp realizes how this is coming across at all. I don’t think he realizes that calling my friends here, who I sought out so that I’d have people who I have things in common with, a “clique” is rude. Or that insinuating that they know why I reject Christianity, and that it’s because I’m injured is insulting. It probably hasn’t occurred to waltsamp that I have very valid, very legitimate, very intellectual reasons for rejecting Christianity; that I realize full well my injury or lack thereof have no impact on whether Christianity is true or not; and that it was, in fact, more painful for me to come to the realization that what I’ve believed and built my entire life upon isn’t what I thought it was; that I’ve considered widely varied ideas of Jesus; and that I’m not at all interested in a better idea of Jesus and religion, but rather I’m interested in the truth. I would say so, too. Of course, you and I (presumably) have no reliable way to know the difference between the two things. This is how the astute among us know that the Xian concept of “morality” is completely circular, and ultimately, it is special pleading. Divine command theory? Yeah, under this policy god could command that we all kill our second born, and this would seen as a “benevolent” act. ‘Can’t argue that god would never command such a thing, because that would require a prior knowledge that it’s wrong. Hmmm. ‘Seems it would be easier to give birth to a live, flaming porcupine than to square it up. Hopefully we can all agree that if Christianity’s “Christ” had no referent in reality, that this would surely constitute “a defect”.